Yes, we really do have to talk about this legal stuff. There are few things you should know about us at Mighty Moms. Firstly, we are not doctors. We are not nurses. (Well, most of us aren’t, anyway.) We’re not pharmacists, phlebotomists, hematologists, zoologists, or dentists. We do, however, like to research. We use online medical journals, medical books, and personal interviews to gather information newborns, babies, toddlers, preschoolers, pregnancies, organization, meal planning, healthy cooking… the list goes on and on and on. There’s nothing we aren’t willing to research. Just remember though, we are just moms like you. Not doctors. When in doubt, give Doc a shout! We TRY REALLY HARD to cite our medical sources, so you can check our phraseology and facts if you want to. Look for them at the bottom of posts where applicable. All this to say that we cannot give you any medical advice! If you have a medical question, seek someone with a medical degree. Mighty Moms is a labor of love, for sure. But it’s still labor. We have to work hard every week creating content, designing graphics, organizing tips and researching facts. It’s an army, really. That’s time spent away from our families and other responsibilities. It eats up time that we could be spending taking our kids out to the park, shuttling them to piano lessons, spending time with our hubbies, or folding laundry reading. What started way back in 2007 as a way to make income for one (Heather), has developed into a community of work at home moms, all pitching in. Here are a few of the ways this website brings in income. Occasionally when we’re discussing a particular product, we’ll use a special link that provides a “finders fee” for referring readers to a particular website. (Like Amazon.com) For compliance sake: “As an Amazon Associate I earn from qualifying purchases.” There you have it! We do occasionally purchase ad-space on social media sites as a way of encouraging new readership and selling products. This means that we do have to use conversion tracking to tell us how our advertising dollars are doing. This means cookies will gather very general-non-specific data and share it with us (i.e. a person purchased a Sleep Session after viewing this ad on Pinterest, etc.). This is standard practice on the Internet and is compliant. We do occasionally offer up the wonderful goodie known as The Giveaway to our readers. As with most things in the world, such an exciting event can ONLY be precipitated by an incredibly boring litany of legal jargon that you should TOTALLY read in your head like Ben Stein. Giveaways are open to readers 18 years or older with U.S. or Canada shipping addresses, unless otherwise stated. No purchase is necessary to enter or win. 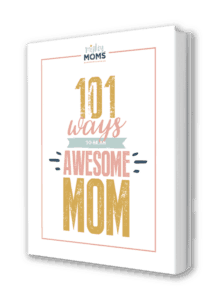 Winners are generated randomly via Rafflecopter unless otherwise noted and announced within the Rafflecopter widget on the giveaway post on MightyMoms.club. Winners will be notified by email within 24 hours after the close of the contest. Winners must respond within 48 hours to claim their prize or it will be forfeited and an alternate winner will be selected. By entering the giveaway through this website, you expressly understand and agree that Mighty Mom, its parent, subsidiaries, affiliates, officers, directors, employees, clients, and agents shall not be liable for any direct, indirect, incidental,special, consequential or exemplary damages, including, but not limited to, damages for injuries sustained by use of the product “given away” (even if Mighty Moms has been advised of the possibility of such damages) to you. Mighty Moms does not warrant the safety of the product you have won or whether it is suitable for your child or children. As the winner, you are responsible to research the product to determine if it is acceptable to you and meets the safety standards necessary for use in your home and by your children. On occasion companies will pay us to write a sponsored post about their product or service. If a post is sponsored, it will say so at the top. We don’t take all sponsor requests! We only accept those that we really, truly, think our readers would be interested in. Friends don’t let friends do fake endorsements. If you have a company and are interested in meeting our audience, please click here for more information.